Let me tell you a story. A few years ago I was using my rotary cutter and quilt ruler to cut some binding strips for a table runner I was working on. The ruler and the rotary tool slipped and I cut off the top of my finger. I'm not exaggerating when I tell you that 1- I had never even considered the possibility of injuring myself with a rotary blade and 2- I'm lucky they could stitch my fingertip back on. I hope that's not TMI, but ever since then I've been pretty vocal about safety when it comes to working with sharp objects! Here are a few things that I've started doing since then (and I tell all my quilty friends to do the same). Buy a cut glove and wear it EVERY time you use your rotary tool. I was just cutting one little strip of fabric when my accident happened. You never know so better safe than sorry. This cut glove goes on the hand that holds the ruler in place and will protect your hand if the tool slips. 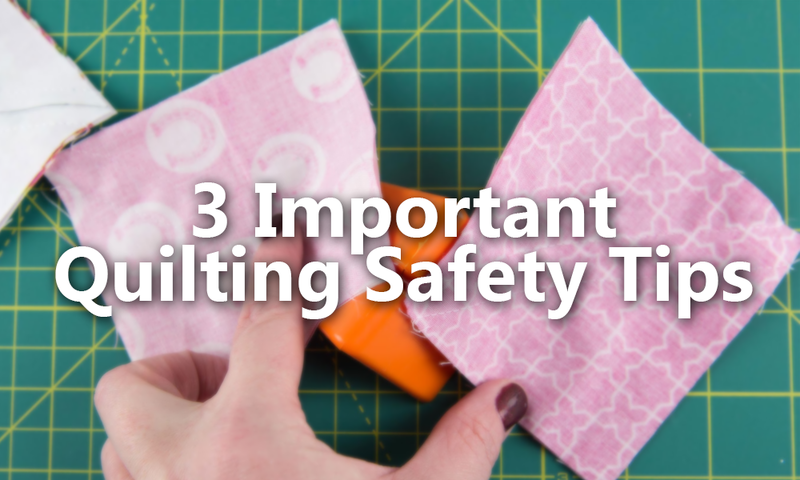 No need to toss out your existing quilt rulers, even if they do slip a little. You can purchase non-slip disks to put on the bottom of the ruler. Most are clear and won't obstruct your view. -Always use your rotary cutter and ruler when standing. -Change your blade frequently, a dull blade is more dangerous than a sharp one as you are more likely to press too hard, increasing the likely hood of injury. -Be extra careful when you're changing your rotary blades. Wear the glove during this process if you need to. -Dispose of dull blades properly. It's dangerous to just throw them in the trash. I keep the case that the blades came in originally to hold the dull blades. I just marked USED on the top with a marker as to not confuse the blades with my un-used newer blades. Tell me, what did I miss? Do you have any tips to share? If so leave them in the comments section so everyone can benefit!